Financial problems at Parma has forced the postponement of Sunday's Serie A game with Udinese. Parma have not paid wages to players or staff since the summer and new owner Giampietro Manenti has failed to make the minimum payments against debt due on 16 February. With cash levels at the Stadio Ennio Tardini reportedly dipping below €40,000 this week, Parma were unable to fund matchday stewards for Sunday's game and therefore requested it be held behind closed doors. But players and coaches from both clubs have "expressed discomfort" over that proposition, leading the Italian Football Federation (FIGC) to order a postponement following a meeting held in Parma on Friday. A FIGC statement read: "The president has taken note of Parma's request that Parma-Udinese, originally scheduled for February 22, take place exclusively behind closed doors. "He has heard from the Italian Footballers' Association (AIC) and the Italian Association of Coaches (AIAC) who have expressed discomfort of players and coaches from both teams about playing behind closed doors. "Decision: the re-arrangement of the game to another date which will be decided by the Lega Serie A." Manenti's Slovenian-based company Mapi Group are Parma's third owners this season. After team coaches and club vehicles were seized from the Collecchio training base earlier in the week, the first team's training session on Friday was cancelled with players growing increasingly frustrated. Parma captain Alessandro Lucarelli said: "We've had a meeting with the president [Manenti] and what has emerged is the difficulty in bringing the money to Italy. He has reiterated that he will try to give us some guarantees in the next 24 hours. "But our patience has a limit. We are a united group and we have given the club an ultimatum. The time is running out. We need action, not words." 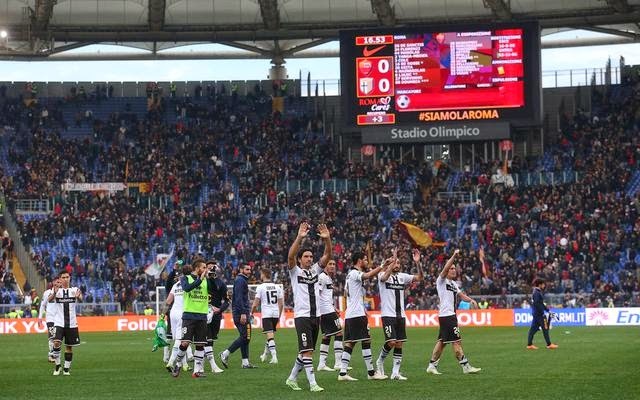 Parma have won only three games all season and sit at the foot of the table, 13 points shy of safety following last weekend's goalless draw at second-placed Roma. Roberto Donadoni's side have collected one point from their last six league games.